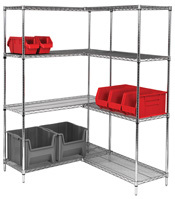 Heavy duty shelving unit allows up to 800 lb. shelf capacity. Starter kits come complete with 4 posts and 4 shelves. Additional shelves may be purchased separately.